Heroes, Heroines, and History: Dress Like Jane Austen--Part 3--And Giveaway! Dress Like Jane Austen--Part 3--And Giveaway! We've looked at women's and men's costume in the past two months, and now we get to zero in on a few details of the gowns. This is just a brief spotlight. For those interested, I'll leave a couple of links at the bottom of the post to books that give more in-depth details and study of Regency costume. So, back to the JASNA Gala Ball, the source of my photos for the past three months' posts. I couldn't help noticing the lovely workmanship that went into the upper portion, or bodice, of a woman's gown, even the back. The Empire style (which reigned throughout the regency) certainly is a huge part of the appeal, but the fabric and craftsmanship really made the difference between a standard dress and an exquisite one, a difference which could be seen even from a rear view. Even the back of the bodice is lovely and elegant. A beautiful example of how lovely the bodice can be; again, even from the rear. Sweet and simple, though the waistline is rather low. Doesn't appear to be an Empire waist, but sweet colors. If the date hadn't been given ("1815-1817"), I would not have been able to correctly date this gown--it does not have an Empire waist. I'm not an expert, but in my opinion this is just wrong! Otherwise, the style and material are certainly fetching. On the right (in rear) a late Georgian style riding habit. Forefront left: Regency; Others, Georgian. Since the JASNA event was in October, there were a few whimsical pumpkins present (contest entries). I thought Cinderella's Coach was well done. Don't forget to check out the additional photos of Regency costume on my website, here. The above is enough to get any student of costume excited and enthralled. What about you? Do you enjoy studying period dress? Do you have a favorite go-to reference or illustrated book? Leave a comment and a contact email and you'll be entered in a drawing to win a copy of my book*, THE COUNTRY HOUSE COURTSHIP. I like to look at period dresses also but I have not researched them. Your book looks good. Thank you for the wonderful photographs. I had not noticed the back of bodices before. I can see the differences now. Love the dresses, love the giveaway! Thank you for the opportunity! The dresses were definitely beautiful back in that time period. I really enjoyed Before the Season Ends and its sequels. Do you have any plans for future books? The dresses are gorgeous. I had no idea they had such detail in the. Thank you so much for the pictures. Wow, it just goes to show how "modern" they were in their intriquite design. Thank you for the opportunity to win one of your new books. I can't wait to read more of them. As for the payment of seamstresses, Deanna, that is a good topic for a future post. In general, they were miserably paid and endured long, long working hours. As for future books, Rebecca, I've just finished a YA (young adult contemporary suspense) but I do hope to return to the regency by publishing a few manuscripts I have in my files. Thanks for inquiring. Period dress is nothing I have ever studied, but these are lovely! The dresses are gorgeous. Sometimes I wish we still dressed like that on more than special occasions. Thanks for the information! Thank you for sharing these lovely pictures. How fun to imagine the ladies in their finery! The dresses are lovely and so intricate. What a nice occasion. Thanks for the pictures. Thank you for sharing pictures of the dresses (and more) . . . that walking dress . . . Wow! Loved it but gosh am I glad I don't have to dress up all the time! : ) chris_davebures@bellsouth.net Thanks! Thanks for sharing the pictures. I love Regency fashion, and was blessed to wear a Regency gown last year. Linore, the link to Empire Fashions doesn't work for me. I plugged it into Amazon and got a book by Tom Tierney--is that the one? I'm sorry about that--I notice that none of my links are working! (Grr.) But yes, it's a grown up coloring book, but the details are wonderful. You won't find a lot of explanation accompanying the drawings, so other books are important to consult, too, but I think Dover does a great job with its costume collection. What occasion were you dressed in Regency style for? Was it a costume ball? Btw, this timestamp says it's after midnight but here in Oklahoma it's only 11:54pm - I hope I can still enter!? I love looking at period outfits! All of the beautiful details, grace and simplicity done into each piece! As young teen I loved sewing my own dresses for choir and concerts. Hoping to capture some of the time of past. Wendy, I'm impressed with anyone who sews clothing. My mother is an accomplished seamstress and quilter. I have been blessed with many talents, but sewing is not one of them! Go, girl. :) You're in the drawing. The costumes are gorgeous and beautiful. I wish I have the talent to make the dress. Thanks for showing some examples and your generous offer, Linore. I hope the competition is open worldwide. Where are you writing from, Luthien? I normally do limit giveaways to the US and Canada, but I can make some exceptions. If you are willing to accept an ebook edition, I'll send it anywhere in the world. WINNER! WINNER! Thank you all for entering the drawing! 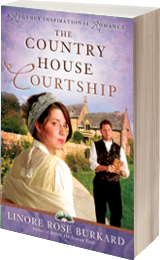 The winner of a copy of The Country House Courtship is Patty! I'll run another giveaway next month (11/20) so be sure to return for that. Also, I'm giving away five copies of The Country House Courtship in November on GoodReads, so head over there to see the rules for entering. I'm sure it's super easy.